I’m certain we’ve all felt those same emotions from time to time. Come to think of it, I don’t know a single person who hasn’t felt the full range of these emotions.Comes with being human I suppose. Aren’t you glad however that as a Christian you don’t have to languish in situations like these? I happen to believe that God has a better plan for us and all we need to do is reach out to Him in prayer and He will reveal it to us through His word. The Word that is powerful and sharp. That Word that cuts coming and going. That Word that cuts away the world’s ideology and in it’s place gives us a calm assurance that there is One who is in control. And sometimes we just need to be reminded that Someone far greater than ourselves has this whole thing in control-even when at times we wonder if that is really the case. David was a man who knew something about taking his many problems to the Lord,didn’t he? One of my favorite stories in all of scripture is when David and his men returned to the city to find it had been burned and all their wives and children taken captive,yet in the end God prevailed once again. God does that a lot,doesn’t He? Upon returning to the city and finding such carnage, it was only natural that everyone began to weep at the thought of what has just happened.In fact they endured so much grief that they reached the end of how much a man can grieve! Many of us have been there,done that. The resulting loss of their loved ones had a devastating,crippling effect upon these fierce warriors and left them stunned and confused. 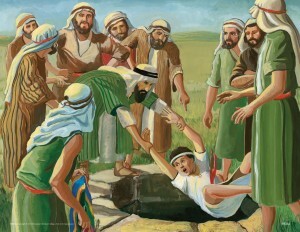 The people that were with David made their decision,a decision to stone David to death. After all, he was their leader and he had obviously failed them. But thank God,David made a different kind of decision. David made the only decision he could. I mean,what else could he do except turn to his God? For certain he was about to be killed by his own men,and when faced with that he did the only thing he could do and that was to take it to the only One who could rescue him. There’s a great lesson here for all of us.The next time we find ourselves doubting, confused,rejected,or whatever…take it to the Lord! David strengthened himself in the Lord….and you can too! Now, I don’t pretend to know what David said to his men to get them refocused on the task of rescuing their loved ones because the bible doesn’t say.But wouldn’t you love to have been there to hear that speech? 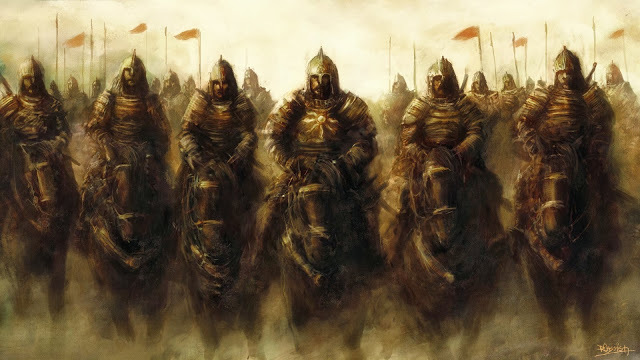 What we do know is that David inquired of the Lord his men must have heard him because the next thing we find is David and his six hundred men charging off to rescue their loved ones! How marvelous that the end of this story is so different than the way it began. But wait a minute…isn’t your story the same? Your end will be much greater than your beginning if you take it to the Lord and strengthen yourself in Him! Just give me the real thing….please! Everyone’s church is “THE” church.Just ask someone. “There’s good people in all churches”we say. Do “good people”qualify as His church? And what about HIS church? Has it breathed it’s last breath? Is it on fire for the Lord doing the work of an Evangelist? Would Jesus recognize it if He were to show up at your church on Sunday? But you say “He shows up every Sunday at my church”! Really? Then your church must be bursting at the seems for all the people trying to get inside. Every hospital around your church must be empty if Jesus comes to your church every Sunday. Your community must be the most loving community around. You probably haven’t had a need for prayer meeting in a long time since Jesus shows up every Sunday. Unfortunately,most everyone else hasn’t experienced Jesus in their church in so long they have forgotten what it’s like. We still have His name on the building,but no one’s seen Him around in a long time. How sad that we go through the motions,yet we leave the service exactly as we came. Just more of the same church. Yet so far from the Christ. Either we’re in or we’re out. There is no “middle ground”,no fence straddling permitted. I dare say nearly all of us have felt at times like our tank is running on fumes. Between running errands, taking the kids to one practice after another, getting dinner ready, plus the burden of working to make all of this possible. No wonder we’re tired!! And if we’re being honest, isn’t some of that self induced? I mean, whatever happened to just saying NO once and a while? Now,there’s a novel concept! But what about your spiritual life? Have you ever felt so drained that your spiritual get up and go just got up and went? If so you wouldn’t be the first one to feel that way.Many of us are feeling the pressure from the world to conform to their image of “Christian”. The doctrine of inclusion which says anything is acceptable and everyone is welcome to partake has permeated nearly every facet of the modern church.So much so that there is scarce mention of the word “standard” in the church today. And the struggle to live according to God’s plan takes it’s toll on us.Many are struggling with this idea that what they’ve been taught all their lives is suddenly of no value. Or as one elderly saint asked me one day” “Ron,what has happened to the church”? What used to be right is now wrong,or at the very least has been transformed into yet another shade of grey.Absolute truth as found in God’s word has been supplanted by “truth”as defined by a society determined to replace God with one of it’s own design. Our land is filled to running over with false prophets who speak after the imagination of their own thoughts.How do I know this? If anyone speaks a word that conflicts with the scriptures,that is a false prophet.Listen to what they say-then check your Bible to see if it lines up. Simple. Pastors,Priests,Teachers,all rule by their own authority,and God’s people love it that way! Have you ever wondered why that is so? I believe it is because the majority of people in church today do not care to know the truth.They are content to let a person do their reading for them. Content to allow someone else to go to God for them.In other words, too lazy and too indifferent to care. And we wonder why our spiritual tank is running on empty? But thank God we don’t have to be that way! 1 [[A Psalm of David.]] 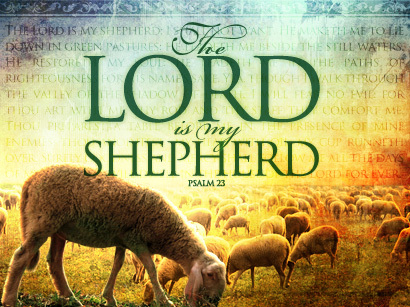 The LORD is my shepherd; I shall not want. I love how this psalm speaks of peace and rest.Everything that a weary traveler needs is contained in these few verses. If your tank is running on fumes,He will lead you to a place of rest and peace.A place of restoration. “Lord,can I ask you a question”? Did you ever “go along” just to “get along”? I think most of us do that because people generally have an aversion to conflict, and it just makes it easier for everyone if we all just “go along” for the sake of getting along. I see it in the workplace all the time where someone will have an alternative point of view, but rather than be the lone dissenter in the group they just throw in the towel and go along with the crowd. We’re probably all guilty of that. I see it in church meetings as well. The pastor or elder will have an idea about something and rather than speak up if there is disagreement, the group will simply just go along to get along. How boring and utterly depressing that we would be like that! Is that how our Creator made us? I think not. Did you get that? We are wonderfully made in His image! We were not created to simply remain mute while our hearts are stirring within us! Does that sound like a cookie cutter type of Christian? Or worse yet…the dreaded “Bobblehead” Christian? You know the type, right? They’re the ones who always just sit there and nod their head in agreement with anything and everything that goes on as if they don’t have an opinion or thought of their own. Well…..that isn’t me. I have no problem questioning things. Not because I enjoy conflict or somehow get a kick out of watching others squirm. Not at all, for I’ve been on both sides of this many times. If we never question anything how do we learn? How do we know if there are other options out there that might actually be better than the one being proposed? I think the Lord wants us to ask the tough questions and yet it’s almost funny how some feel threatened when you don’t “go along” for the sake of “getting along”. Many, many times in my Christian walk I have questioned the Lord. Haven’t you ever done that? Haven’t you faced tragedy or extreme circumstances that have left you bewildered to the point that you simply want to know “God, where are you”? In the midst of a season of deep despair I actually took my bible and opened it to Romans 8:28 and began to ask God “how can this verse be true”? I was so desperate for answers that I didn’t know what else to do but ask! Beloved, when your heart has been ripped out and you feel like giving up on life even though you are actively involved in ministry and believe you’re doing your best to serve God, it can be hard to believe that what you’re going through will somehow work out for your good! Let’s be honest here can we? Don’t you find that sometimes it’s hard to “go along” with God’s plan, even though you know deep down that He has your best interest at heart? If I’m being transparent here I must admit that I feel that way at times. I question God about many things, things that I should probably just give up asking about and accept. But I wasn’t created that way, and neither were so many of you! I have no doubt that there are questions I have that will never be answered this side of heaven, and somehow I’m OK with that because I know that my Father loves me and is looking out for me. Really…as a Christian the Cross is both a sign of excruciating agony and an offering of forgiveness.It is a symbol of love and hate.Beautiful and ugly beyond words. And only God could take something so heinous,so brutal,and so despicable and turn it into an instrument of His grace and love. Before the time of Christ upon the earth,crucifixion had been employed for hundreds of years as a means of humiliation and death.It was by no means something that was seldom seen but was in fact reserved for those “deserving”of a special death.As a matter of fact, even the scriptures declared that if a man were to be crucified,he was considered to be cursed. I’ve often wondered how many times Jesus had seen someone being executed on a cross in the Roman occupied land in which He lived. I think that surely He must have seen the agony of others,even if but for a fleeting moment before He looked away…..knowing that what He saw would one day become His destiny as well. May we never forget the price which was paid for our sins. May we never forget that the cross was not meant to be something worn as a religious symbol,but rather an instrument of inhumane torture.There’s nothing stylish about that. May we never forget that while we were yet in our sins Christ died for us.Once and for all the price had been paid that would enable us to become sons and daughters of God Almighty. The Cross……it is the key that unlocked the door to the splendors of heaven. We Just Never Know Sometimes! Many no doubt are familiar with the biblical story of Joseph found in the book of Genesis and how that God used him through difficult circumstances to save his entire family.Just in case you’re not familiar with the story let me see if I can give you the micro version of it. Joseph was the youngest son of Jacob and was one of several children born to him.Jacob had a tender heart towards Joseph and because of that there was much jealously in the hearts of his brothers.So much so that his brothers devised a plan to get rid of their younger brother.Did I mention they were jealous of him? His brethren went back to their father and told him that his favorite son was dead,apparently devoured by wild beasts. Can you imagine the level of deceit that must have been in their hearts that they would do such a thing and break their father’s heart? Jealousy is indeed a very powerful force! But what does any of this have to do with me you ask? Have you ever endured such pain at the hands of another? Have you felt the sting of betrayal and abandonment? It is difficult to think this but there are many people in this world that seem to take pleasure in afflicting others.I do not understand this mindset at all and often wonder what kind of life a person must have lived to be able to do this to another person. Joseph’s brothers did what they did to him for very selfish reasons in the hope that once he was gone their father would look upon them the same way he did his youngest son.But as is often the case,there was more to this story than what it seemed to be. For you see,God had another plan for Joseph.A plan that his jealous brothers were unaware of until many years later. It’s all about the heart and it’s motives.Joseph’s kept his heart pure even though he knew he was completely innocent of any wrongdoing.He was falsely imprisoned and left for dead for refusing to give into the lust of the flesh.Yet he maintained his integrity through it all. And so it is with you and I.Regardless of what life throws at us we must do our very best to maintain an upright and pure heart because God always has another plan for us! Did you get that?Joseph’s brothers thought they had hatched the ultimate plan to rid themselves of their kid brother…but God had another plan! We just never know sometimes what God is up to in our lives,but if we keep our hearts pure it’s for certain that we will eventually know!